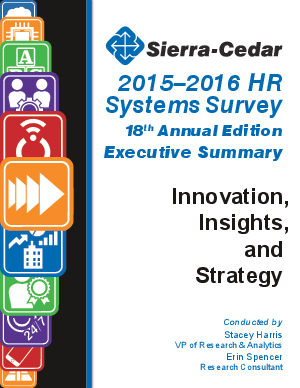 The Sierra-Cedar HR Systems Survey stands alone as a global benchmark of Human Resources (HR) technology adoption and the value achieved from the use of these technologies, seen through the eyes of HR Information Technologists (HRIT) and Information Technologists (IT). This year’s White Paper covers adoption and trends for applications, deployment options, vendor solution outlook, expenditures, and value achieved for the following categories of applications. Throughout the report, we suggest implications and recommendations for both practitioners and vendors.